Defensive shifts such as this are commonplace now (via GabboT). As defensive shifts have become more pervasive in baseball, so has the mystique surrounding their supposed effect. Early this year, Jonah Keri identified defensive shifts as one reason for the recent decline in baseball offense. By early July, David Lennon placed basically all of the blame for baseball’s offensive challenges on the shift. Like Keri, he pointed to declining batting averages as proof that the shift was working too well. Things reached a fever pitch a few weeks ago when Tom Verducci ran with an idea that Lennon had proposed: banning the shift in some form, lest baseball offense never recover. This false association is worrisome. No one feels sorry for declining millionaire pull hitters, but many people are sincerely concerned about declining offense in baseball. Successfully associating the rise of the shift to the decline in baseball offense could convince people to support drastic changes in the game. In 1968, the Year of the Pitcher famously resulted in the mound being lowered and changes to the strike zone. Let me be clear about one thing: shifts are not affecting overall baseball offense. Shifts are not producing less value on balls put into fair play. We are facing a troubling decline in baseball offense, but if we want to treat the illness, the first thing order of business is to diagnose it correctly. The primary reason people blame the shift for declining offense is because they are citing the wrong statistics. It won’t surprise you to know that batting average, the primary diagnostic used by the columns cited above, is as misleading in this context as it is in most others. But statistics that are usually more reliable, such as On Base Plus Slugging (OPS) and weighted On Base Average (wOBA), also provide the wrong answer in their typical form. This is because understanding the effect of defensive shifts requires you not only to use the correct statistics, but to use the right denominator under those statistics—specifically, limiting their focus to balls put into fair play. By reweighting the best of these statistics—wOBA—with the correct denominator, we can both correctly ascertain the current value of baseball contact and understand why the decline in baseball offense has nothing to do with the shift. At 4.11 runs per game through the end of July—admittedly with plenty of warm weather yet to come—the 2014 season seems unlikely to post any improvement. There are certainly reasons for this decline that go beyond defensive strategy. At the end of the 1990s, baseball was coming out of an expansion era that had diluted the quality of league pitching. The use of performance enhancing drugs (amphetamines, steroids, and the like) also was increasingly scrutinized and heading toward decline. Overall, you can see three general time periods on the chart: the end of the high-flying 90s; a time period from about 2001 through 2009 when run scoring more or less stabilized around 4.7 team runs scored per game (“runs per game” or “R/G”), and from 2010 through 2013 when the bottom fell out again, down to under 4.5 runs per game. The chart presents three composite offensive statistics of varying quality: (1) Batting Average; (2) On-Base Plus Slugging (OPS); and, best of all, (3) weighted on-base average (wOBA). We all grew up with batting average, but it is imprecise and often misleading. OPS is an improvement, though it is still somewhat imprecise but usually not misleading. At the top of the ladder is wOBA, which accurately averages the reasonable values of each offensive event. All three statistics suggest the same conclusion as the runs chart: very high batter production during the late 1990s, a reduced period of production during the early to mid-2000s, and finally the last four to five years when production has declined steadily even further. Offense is down, and the on-base production statistics are plunging at the same time the shift is growing in popularity. Therefore, the shift could fairly be blamed as a contributing factor, right? As Dave notes, this chart obviously is inconsistent with the idea that balls in play are being stifled by the shift. 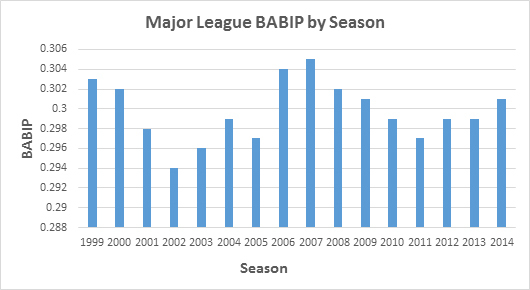 BABIP is higher than it was 10 years ago, and BABIP has been increasing, rather than decreasing, over the last few years as more shifts have been implemented. But Dave’s point, although accurate, is more of a first step than the final answer. Old-fashioned BABIP pretends that all hits are of equal value, which obviously they are not. Extra-base hits are much more valuable than singles. And the goal of defensive shifts is not merely to turn singles into outs, but to turn doubles into singles and perhaps home runs into bloop hits as hitters supposedly try to salvage their plate appearance by hitting the ball around the shift, compromising their power as they do so. More importantly, in appreciating the value of hits (and lost hits), we need to remember that the offensive values of each type of hit are dynamic in nature: if tracked over the course of a season, they fluctuate along with the overall run environment. In particular, the fewer the hits we have, the greater the value of the hits that still remain. The increasing value of the remaining hits can—and in this case do—compensate for hits that might otherwise be getting stopped or limited by defensive shifts. In short, analyzing the shift requires us to appreciate: (1) the need to look specifically at the productivity of balls in fair play, rather than all plate appearances; (2) the need to correctly weight the value of each hit that does occur in fair play; and (3) to recognize that the value of each type of hit is connected to the run environment in which it occurs. None of the standard statistics cited above allows us to satisfy all three requirements. Batting average and BABIP flunk criteria (2) and (3), because they treat all hits as equally valuable; OPS and wOBA fail criteria (1), because they have the wrong denominator, using all plate appearances (which would include walks and strikeouts) instead of just fairly-hit balls. We need something different. BABIP already has the right denominator, so one step might be to take BABIP and apply dynamic linear weights to it (a “wBABIP,” if you will). But remember, BABIP excludes home runs, and home runs are the ultimate equalizer: even if a double is reduced to a single, or a would-be single ends up being a mere “productive out,” the home run still exists as a means to clear the base paths and score most, if not all, of the desired runners. So we can’t just use “balls in play,” as that concept is generally used. We need to include all fairly-hit balls. In sum, to understand the possible effect of the shift on baseball offense, we need to include home runs, we need to include the correct weights for each season, and we need to have the correct denominator. The numerator consists of each type of hit, multipled by its offensive value (the “w” variable), with the results summed. The denominator is all at-bats, minus strikeouts. This allows us to capture all balls in that are put into fair play. I’m not the originator of this formula: it previously has been described as “wOBA on contact” or “wOBAcon.” wOBAcon pops up from time to time but really has not stuck, in part because no one seems to have a consistent use for it. wOBAcon is perfect for our purposes, though, because it allows us to measure whether offense on balls in fair play has truly declined over the last 15 years or not. If it has, then and only then is it fair to question whether the shift is reducing baseball offense. 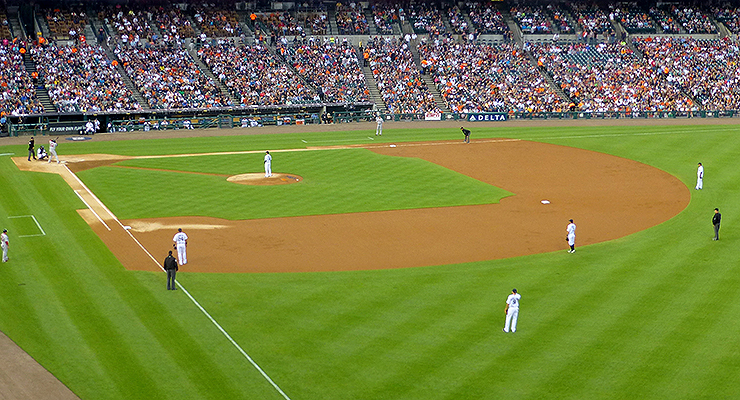 If the value of baseball contact has not gone down, though, the shift is irrelevant. It is a convenient scapegoat and nothing more. Now that we finally have the correct metric, let’s chart and then plot our decline in runs against the league’s non-pitcher wOBAcon and answer the question once and for all: Is offense down on balls being put into fair play? Although there is a connection between wOBAcon and Team Runs per game (more on that in a moment), the values we care about are from 2010 onward. As you can see, there is no discernable connection between the rise of the shift and the plunge in baseball offense during that time period. In fact, production on balls in fair play (as measured by wOBAcon) has been trending upward at the same time scoring overall has been trending downward. This finding would seem to exonerate the shift. If the value of balls in fair play is not actually declining, then the shift, by definition, cannot be responsible for a coincidental decline in baseball offense. The claim that the shift is responsible for decreased baseball offense is wrong, and changes to the game designed to limit the shift would make no difference, to say nothing of their unintended consequences. So please, stop blaming the shift. Declining offense is a problem, but it is not being caused by the results of balls in play. Two final points. First, in his Instagraphs piece, Dave Cameron blamed the decline of offense on the increase in strikeouts. I think the data suggest that the decline in walks (since 1955, r=.6, p<.00001), is more responsible than the increase in strikeouts (since 1955, r=.3, p<.02), but the two obviously are related. Either way, this means that people’s misguided focus on the shift would be better directed toward the size of the strike zone. 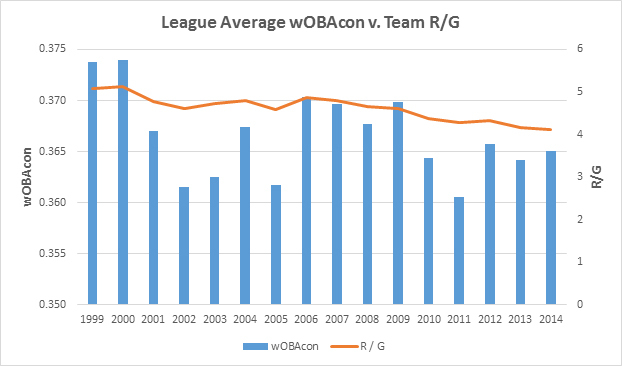 As you can see from the chart, the differential between wOBAcon and wOBA is greater than it has ever been, which means that run-scoring should be going up, not down. And yet the opposite is happening, and dramatically so. In other words, something in the system appears to be broken—something like the strike zone, for example. Moreover, the deviation from the predicted trend is growing stronger. In 2011, the standardized residual was -1.07. In 2012 it was -1.19. In 2013, it was -1.66. So far, 2014 is on pace to deviate even further in this unexpected direction. We have seen negative deviations of this magnitude before, during the so-called Second Deadball Era of the 1960s. We first saw them from 1963 through 1966, when these z-scores ranged from -1.08 to -1.27. The trend continued as we approached the Year of the Pitcher, reaching -1.89 in 1967 and an astonishing -2.93 in 1968. After changes were made to the mound and strike zone, the trend then rebounded briefly before plunging again to -1.17 in 1971 and -1.86 in 1972. I mention this because in 1973, the American League adopted the designated hitter. 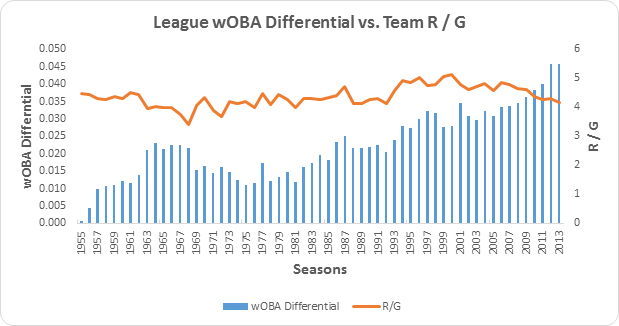 It took 39 years after the addition of the DH for the wOBA differential to veer back into the territory of the 1960s. This finding is interesting because one idea being floated for increasing baseball offense would be adding the designated hitter to the National League. Would adding the DH to the NL help address this most recent decline in baseball offense? Maybe next time, we’ll give it a look. According to Baseball Information Solutions, teams shifted 2,400 times in 2010 and 2011, 4500 times in 2012, 8,100 times in 2013, and are on pace for 13,000 shifts in 2014. All data in this article combine American League and National League teams. The data have not been park-adjusted. Fangraphs has a “Guts” page that displays the seasonal value for each batting event. Jonathan Judge has a degree in piano performance, but is now a product liability lawyer. He has written for Disciples of Uecker and Baseball Prospectus. Follow him on Twitter @bachlaw. Does this mean teams should stop shifting? Another thought I had while figuring this out – what if the extra strikes are entirely due to increased usage of or talent in pitch framing? The 0.13 number came from the first article to study pitch framing, which I think, did come out in 2008. I got halfway through the article and was distracted by bacon. I, for one, do not find the decline in scoring in baseball “troubling.” One team tries to score, the other tries to prevent it. It’s not basketball. Nothing wrong with a well-pitched, well-defended 2-1 game. wOBAcon sounds like a horrifyingly nerdy and utterly fantastic convention. I should also note that ‘develop’ is in air-quotes because the research found that pitchers’ quality pretty much peaked in the early 20’s, which is where we’re seeing a lot more pitchers hitting the majors (rather than in their later 20’s). Thanks for using my picture above for the article. I enjoyed reading it. FYI, batter in said picture was David Ortiz vs the Tigers.